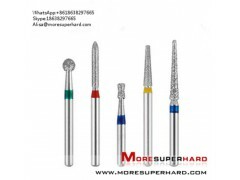 * Diamond burs cleaner cut and the higher polish than carbide burs. * The maximum allowable speed to 400,000/min. * Stalk who used high-grade stainless steel, high strength, no rusty. * convenient and health in use , performance ratio. 2.Insert grinding for machines such as: agathon, wendt, haas, waida and ewag.